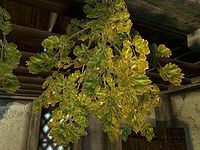 Frost Mirriam is a herb commonly found hanging to dry in homes side by side with garlic and elves ear. It is not possible to harvest fresh frost mirriam directly from plants. However, like plants, harvested samples will respawn after a given length of time. It is categorized as an uncommon ingredient, meaning that all apothecary merchants have a 15% chance of carrying 1-5 samples. In addition, it may be randomly found in uncommon- and rare-type apothecary's satchels. Frost mirriam is one of 4 items needed at the Atronach Forge to create a Spell Tome: Conjure Frost Atronach. This page was last modified on 9 April 2018, at 04:26.